Reflecting the diverse range of our clients’ requirements, we offer different types of drumming workshop. For example, we offer African drumming workshops for clients keen to have a totally authentic and traditional African experience. 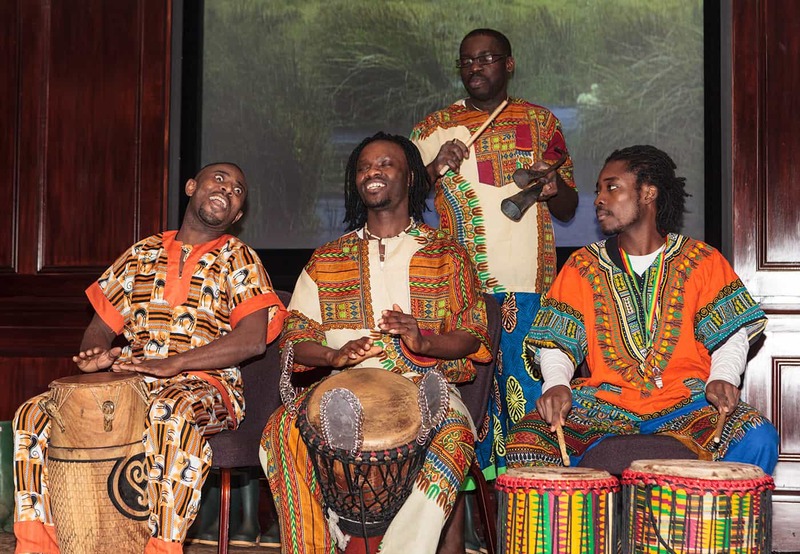 For this, we have a group of Master Drummers from Ghana, who live here in the UK. Their style of teaching, passion for accuracy and understanding of the instrument history mean that participants in these workshops receive the highest standard of tuition. Not only this, they get first-hand accounts of the crucial role that drumming, music and rhythm play in creating a strong tribal community. It is fascinating to hear from them about their musical apprenticeships in Ghana, the hours of dedicated practise they have put in and their coming of age as master drummers in their villages. In our African drumming workshops, all participants first learn the proper techniques and sound possibilities of a drum called the Djembe. Next is the learning of the actual drum parts. Most African drumming music is a matrix of three or four interdependent parts. While each isolated part can sound very simple on its own, when merged together, the overall impression is one of complexity, with a strong and addictive pulse. We usually divide the overall group of participants into different rhythm parts, and then show how they fit together to create the full ensemble sound and feeling of an authentic African drum troupe. Our participants get a huge sense of achievement from staying focused in their learning, mastering their given roles and creating a culturally-specific traditional performance. This concept of recreating ancient, but defiantly predetermined, drum parts differs from our other drumming workshops, where participants are encouraged to create their own ideas. Both formats are equally valid and successful, and guarantee total engagement.